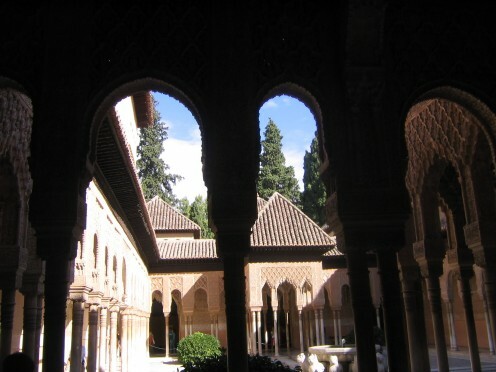 Tales of the Alhambra; Washington Irving – Speak Out in Spanish! Famous North-American writer, historian and foreign ambassador, Washington Irving was born of an English mother and a Scottish father, immigrants into the United States. Irving was born in Manhattan, New York, on 3rd April 1783, his mother naming him Washington in honour of President George Washington. Washington Irving is probably better known for ‘The Sketchbook of Geoffrey Crayon, Gentleman’ (1819-1820), a collection of ‘sketches’ or short stories including the celebrated ‘Rip Van Winkle’ and ‘The Legend of Sleepy Hollow’. He is also well-known for his historical work, namely ‘The History of New York from the Beginning of the World to the End of the Dutch Dynasty’ (1809) and also for ‘The Life of Washington’ (1859) a study of the life of the American president, George Washington, (Irving’s namesake but also for whom he had felt the greatest admiration. Although a prolific writer of differing styles, Irving was a master ‘raconteur’ and it is those skills which he so well employs in his famous ‘Tales of the Alhambra’ published in 1832. In this ‘travelogue’ par excellence, Irving recounts his journey through Andalusia, in southern Spain, especially focusing on his stay in the beautiful Alhambra palace, which inspired him to write these ‘tales’. The beautiful Alhambra Palaces and Fortress by night, with Sierra Nevada in the background. The Alhambra (From the Arabic ‘Al- Hamra’, meaning ‘The Red One’) was built between 1333 and 1391 by the Nasserite rulers: Yusuf I and Mohammed V. It is located in the city of Granada, in the Andalusian region of southern Spain. Andalusia takes its name from the Moorish term Al-Andalus. It is considered one of the jewels of Andalusian architecture, a legacy from the Moorish occupation of Al-Andalus, the southern-most region of Spain. Washington Irving writes as if he were leading us blindfolded, by the hand, around the palace and paying great attention to detail, realising that we thirst for every small detail he describes for us, however insignificant it may seem. He literally paints the picture of the Alhambra for us with his pen. Yet he also paints the atmosphere, his own feelings and emotions, the fragrance of the gardens and the play of twilight upon the exquisite tiles. If you were there, you would be captivated by its magnificent grandeur and yet also by its subtle beauty! If you have already been there, then words cannot re-create, in true measure, what you already know! What we find in this book is an account of Irving’s journey around Andalucía in southern Spain in 1829. It is a detailed description of the city of Granada, with its warm, friendly people, a precise description of the different chambers and halls of the palace and all this lavishly peppered with elaborated legends told to him by the inhabitants of the area during balmy evenings in the palace grounds. Washington Irving had the great honour of being invited to actually occupy some chambers in the palace itself, thanks to his already important reputation in literary and diplomatic circles. In evidence of this, a commemorative plaque is visible above the door stating the writer wrote ‘Tales of the Alhambra’ in those rooms in 1829. The wonderful mêlée of fact and fiction makes the line between reality and fantasy become so blurred that you feel as if the fantasy were true or that the factual content of his work may be simply part of the beautiful legends he creates so well. “In it [the book] we find a highly romantic outlook, all coloured atmosphere, together with acutely observed, first-hand impressions, full of subtlety, humour and feeling”. As we read ‘The Tales of the Alhambra’ we find Irving wandering from chamber to chamber around the palace, pausing to describe the architecture and decoration in exquisite detail, and then relaying the legend associated with that particular room or area as told to him by his trusty guide, Mateo. For example, as he is walking into the Lions’ courtyard, he is surprised to meet a “turbaned Moor, quietly seated near the fountain”. He then goes on to tell the Moor’s version of the fall of Boabdil, the last Sultan of Granada, to fall at the mercy of the Catholic Kings, Isabella and Ferdinand. Yet this is not just a passing comment. Irving shows here his complete understanding and historian’s appreciation of the fall of Granada into the hands of the Christians, as he slips easily from the myths, legends, beauty of the palace to exacting historical fact and in my opinion, this is where his great skill lies. This is what makes the book a truly delightful experience for the reader. In the chapter of ‘The Legend of the Arabian Astrologer’, Irving describes in few words the Sultan’s first sighting of a Christian princess, daughter of a Gothic prince in most eloquent language; “Pearls of dazzling whiteness were entwined within her raven tresses and jewels sparkled on her forehead, rivalling the lustre of her eyes”. His use of grammar is beautifully precise and he takes the utmost of care to describe and express his impressions in impeccable language, in the literary style in use in the 19th Century. It has been largely due to 18th and 19th Century writers such as Irving that the impression of Spain as exotic, and the Spanish people as passionate, impulsive and emotional had become extended throughout Europe and the Americas. Tales of the Alhambra can be purchased on Amazon . Previous Post: Tenemos…We’ve got…a lot of stuff! Next Post: Nervous speaking Spanish? You are not alone! Looking forward to read the book !